After the whirlwind of San Diego Comic Con, I’m still trying to catch up to the real world, sorting through emails, catching up at work, trying to find clean pants amidst the piles of dirty laundry… those kinds of things. I haven’t had much time to wander the interwebs to find new books to covet. I did, however, purchase a couple of books during my San Diego stay, so I thought I’d feature those this week until we here at WFTM get back to our normal schedule. The description above is for volume 2. I’m avoiding the GoodReads.com page for volume 3 because I hate spoilers. Spoilers hurt puppies. I kind of fell madly in love with this series in the middle of our plane trip to San Diego. It was dark and mysterious, interesting and creepy, like a brand new, modern take on a Grimm’s’ faerie tale. The characters were fully created and the twist at the end threw me for such a loop that I almost started cursing loudly on the plane. Thankfully I just turned to Fernando and demanded he find some magical way to get me the next book in the series while we were hundreds of miles in the air. He, of course, was unable to do such magic, and I had to purchase the next two books in the series at the con. I waited until Sunday so that I wouldn’t devour them so quickly while waiting in the Ballroom 20 line. I might have bought a couple of key replicas from the IDW booth early on and caressed them while whispering “My preciouses…” but there isn’t anybody to prove that, now is there? These comics need to be savored, slowly and uninterrupted. Thankfully there is also a volume 4, though I don’t know if the series continues past that. 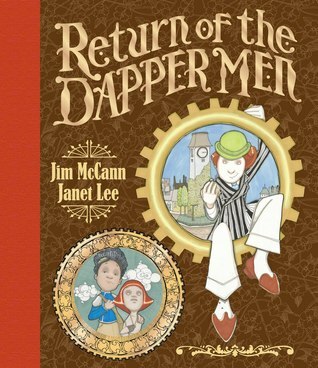 The good people at Archaia were having a buy 1, get 1 sale on Sunday and since I desperately needed to possess Return of the Dapper Men (see the end of this post), I wandered the rest of their selection to find a suitable freebie. I like stories that play with time and, in this case, it sounds like time is a character all its own. Flipping through the pages, the art looked crisp and consistent. While there were other books that looked equally lovely, this one grabbed my interest and refused to let go. Ah, Gronk, how you get me through my Friday afternoons at work. This is a collection of the wonderful first year of Katie Cook’s Gronk web comic. Everything Katie touches becomes adorable. Gronk is no exception. It’s about a little monster who doesn’t want to be scary, so she turns her back on the other monsters and ends up living with a young woman and her pets, a giant dog and a little white cat. I mostly bought it for me (along with some art I hope to show off tomorrow), but also a little bit to share with my little nephew in a not-so-subtle way to turn him into a geeky comic reader in the future. If you haven’t checked out Gronk or heard of Katie Cook, you should go here right now. She’s fantastic, if for nothing else other than her take on Aquaman. Alyss Heart can't stand that "master of fantasy" bunk; she knows that Lewis Carroll was nothing more than an incompetent reporter. After she generously shared her Wonderland experiences with this fledgling author, he totally botched the retelling, even mangling her name. Alyss, however, refuses to merely grouse; she and royal bodyguard Hatter Madigan decide to make another emergency excursion down the rabbit hole, opening our eyes to parallel realms that prim Rev. Dodgson never imagined. A refreshing take on a Victorian classic. 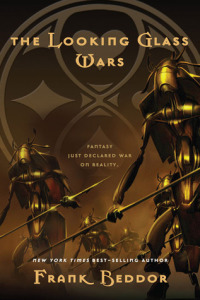 I can’t resist alternate versions of classic stories, and after talking to Frank Beddor at his booth and seeing the gorgeous robot cover art, I had to purchase a copy of the first book in the trilogy. There is also a concurrent trilogy of comics focusing on the adventures of the Mad Hatter when he’s away from Alyss. I’m looking forward to seeing how Beddor twists the well-known tale into something new and exciting, set partly in the “real world”. Pirate Penguin and Ninja Chicken are friends. Or maybe they're enemies. Heck, if they can't keep track, then how can we!? Whatever they are, they're definitely hilarious. We think you'll like this book: there are about a bajillion jokes inside, and it's filled with action, adventure and arguments. Sometimes the stories are really teeny, about stuff like ice cream smoothies or making fun of your friends (just like real life! ), and sometimes the story gets really epic-tastic, filled with spaceships and giant monsters and evil koalas and stuff (just like real life!). Plus, since it's about pirates, there are at least 17 swordfights (that's the rule with pirates). Perfect for friends, enemies, and "frenemies," this full-color collection of wacky adventures will keep you cracking up with no "troublem." Here’s another one I bought partly for me and partly as an attempt to get my nephew into comics. He’s a bit young for the book now, but I think his love for all things penguins and pirates will last for a while. Friesen’s art is a lot of fun and I think this will be a great graphic novel to share in a few years. Anything that combines ninjas, pirates and spaceships is all right by me any day. You can see more about Pirate Penguin vs Ninja Chicken here. This book is goooooooooooorgeous! One of my top goals of this Comic Con was to get a copy of it to snuggle with on cold winter nights. I only vaguely even knew what it was about, but I’d seen its art floating around and loved its uses of pastel colors, the vague steampunk feel, and, of course, all of the very dapper men. Learning more about it at the Archaia booth, the story sounds like it might just have been written for me as well. Altered worlds, robot girls, and men falling from the sky? I think I’m going to have to stop snuggling and/or staring at this gorgeous book long enough to actually read it. Return of the Dapper Men happened to win an Eisner award (the Academy Award of comics) for best graphic novel during the con, so I was lucky to get my hand on the very last copy Archaia had out at their booth. I didn’t get back to Artist Alley to have the authors sign in, but I have a feeling I’ll be attempting to buy art from them next year. Did I mention it’s gorgeous?